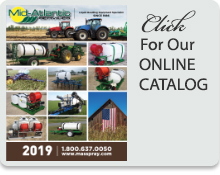 Mid-Atlantic Services (MAS) announced recently that the company was selected to build an underwater sprayer that is used to control midge larvae. The Maryland Departments of Agriculture (MDA) and Natural Resources (DNR) are directing the program which was created by an executive order from Governor Larry Hogan. The MAS midge sprayer is designed to spray an insecticide underwater. It consists of two tanks: one tank mixes the insecticide and the other tank has a spray pump. 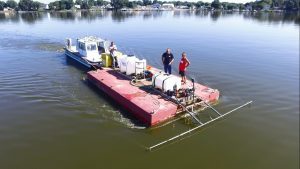 The equipment is placed on a barge and a 27-foot bar drops 18 spray tips 10 feet below the surface to apply the insecticide to the bottom where the midge larvae live. The insecticide is known as Bacillus thuringiensis israelensis (Bti) and is nontoxic to people, mammals, birds, fish, and most invertebrates. The midge population has increased in the Back River. In response to concerns from local citizens and businesses, the State initiated the pilot program to suppress midges in the Back River area of Baltimore County. The initial treatment was applied in September. Subsequent applications are planned for April, May and June, weather permitting. DNR will periodically take samples to monitor the effectiveness of the pilot program.